I think this is my favorite trifle. I have made many, because it is easy and pretty. Every time I make them, they turn out great, but I honestly think that this baby is one of the best. Maybe it is because I love Christmas and cannot wait for it, or maybe it is because the first time I ever made this, it was for some very special people. 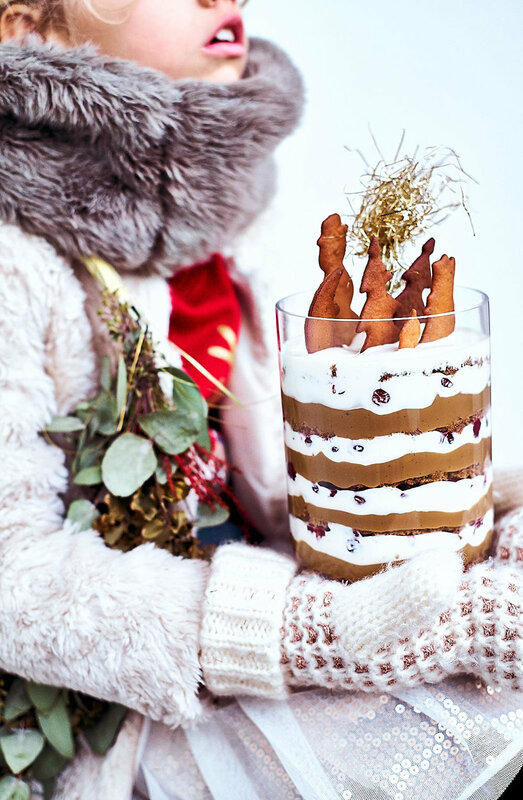 I do not know – but here you have everything you wish for in a trifle. It is sweet but not too sweet: there is gingerbread spice mix, there are cherries (to remind us of the sweet taste of summer), and then there is coffee. Amazing. Can't wait to make this one again. Prepare the custard. Cut open the vanilla bean, scrape out the seeds, and put them in a pot. Add milk, coffee, orange zest and the vanilla bean. Heat until the liquid just starts to boil, and turn off the heat. When that is done, place the egg yolks in a bowl. Add sugar and corn flour and whip with a hand whisk until incorporated. While whipping, add 1/4 of the warmed milk. Still whipping, add the rest of the milk. When incorporated, return to the pot. Leave the vanilla bean in the pot. Place the pot on medium heat and heat for 2-4 minutes, stirring constantly, until the custard thickens. It should be thick enough, so that the custard coats the spoon. You can stir with a wooden spoon, but I prefer a whisk. When the custard is done, pour into a clean bowl, place in a cold water bath, and let it cool down. When it is almost cold, cover the surface with cling film (not the bowl), and place in the fridge to cool completely and so that the tastes meld together. Heat the oven to 200°. Cover the bottom of a 20 x 30 cm pan with parchment paper. Prepare the sponge cake. In a bowl, mix all of the ingredients with mixer for 2 minutes and then pour into the pan, smooth the top, and place in the oven to bake for 20 minutes or until a toothpick placed in the centre comes out clean. When the sponge is ready, remove from the pan and cool on a rack. When you are ready to make the trifle, whip the cream with salt, sugar and orange zest until it holds it shape and is stiff, but still smooth. Add to the sour cream and fold in. In a glass bowl or in smaller dishes, begin to assemble the dessert. Cut out the sponge exactly the size of the bowl. First place the sponge cake (crumble the cake into medium sized pieces), add the custard, cherries and again sponge. Then another layer of sponge, custard, cherries and cream and make as many layers as you wish using all of the sponge (some of the sponge layers you have to “glue together”. Finish with cream and decorate with gingerbread or any other way. Let sit for a few hours before serving. * If the cherries are not sweet enough, boil them in syrup or mix with some sweet preserved cherries (remembering that the sponge and cream is sweet).